Beginning this Thursday evening, the University of Puget Sound and the Race & Pedagogy Institute will be hosting the fourth Race & Pedagogy National Conference. This year’s conference is centered on the theme of “Radically Re-Imagining the Project of Justice: Narratives of Rupture, Resilience, and Liberation,” and will feature a variety of poster presentations, speakers, performances, and exhibitions. Held on the Puget Sound campus every four years, the RPNC was created with the mission of providing teachers and students with the necessary tools for thinking critically about issues of race and advancing terms and practices that will allow them to act to eliminate racism. In the Archives & Special Collections, we are honored to be participating in this conference in several ways. 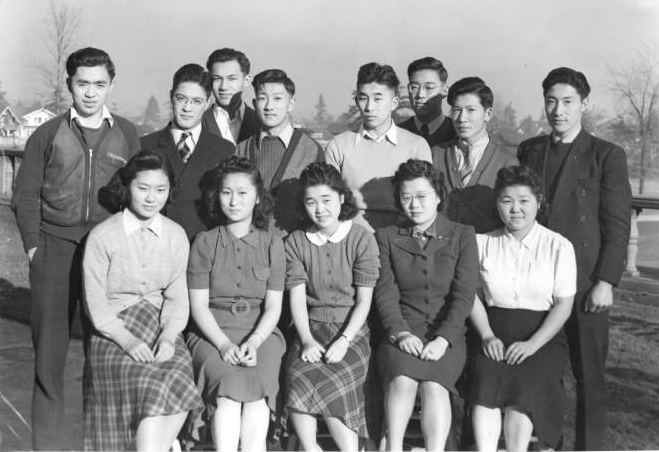 Over the past month, I have been working on curating an exhibit about the incarceration of Japanese Americans during World War II, with an emphasis on the 36 Puget Sound students who were among those excluded from the West Coast. The exhibit is divided into three sections: before incarceration, incarceration, and remembrance. The first section highlights the successes of the Japanese American community in Tacoma and on the Puget Sound campus; in Tacoma’s Nihonmachi (Japantown), Japanese American businesses thrived and the Japanese American students on the Puget Sound campus were active in all aspects of campus life. However, racism still loomed in the background in the form of Japanese exclusion leagues, anti-Japanese immigration laws, and general prejudice. This racism reared its head in the wake of the attack on Pearl Harbor, leading to Executive Order 9066, which allowed the federal government to exclude groups of people from certain areas of the country during wartime. This brings us to our next section: incarceration. 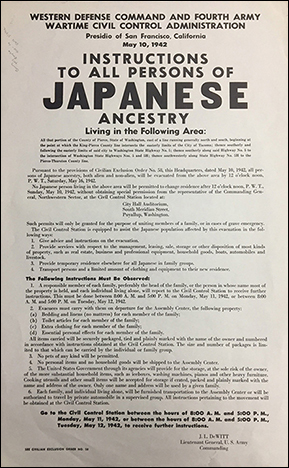 In May 1942, Japanese Americans were “evacuated” from the West Coast, sent to “assembly centers” near the areas of exclusion, and then removed to “relocation centers” further away. Conditions in these camps were unacceptable: detainees lacked privacy and adequate food, family units were broken down, and the physical environment was extreme and inhospitable. After incarceration, few Japanese Americans returned to Tacoma, but their legacy on the Puget Sound campus still exists, bringing us to the section on remembrance. The grove of cherry trees on campus has been maintained and replanted since 1939, when the original members of the Japanese Students’ Club (never revived post-incarceration) donated the original trees. In 2009, the university bestowed honorary degrees, Nunc pro Tunc (something that is done at one time that should have been done at another time), on the 36 incarcerated students. The exhibit, entitled “Looking Like the Enemy: Japanese American Incarceration during World War II,” will be located outside of the A&SC on the second floor of Collins Memorial Library for the remainder of the fall semester. Come check it out! Also, if you’re interested in learning about how archives relate to the mission of the RPNC, Archivist & Special Collections Librarian Adriana Flores will be participating in a panel discussion on Friday at 1:30pm in the Archives Seminar Room titled “The Liberated Archive: Creating Inclusive Spaces for All Histories”. The Archives & Special Collections is open Tuesday through Friday from 10:00 a.m.-3:00 p.m. or by appointment. This entry was posted in From the Archives. Bookmark the permalink. Imagine you could hide the darkest, most horrifying secret. Forever.